Explore the charming seaside village of Greenport from this quaint 1-bedroom, 1-bathroom vacation rental apartment with sleeping accommodations for 2. Only a couple of blocks from downtown, enjoy quick access to numerous restaurants, boutique shops and local attractions. Your ultimate North Fork adventure awaits you in this incredible apartment! Enter into this lovely charming apartment through a warm and inviting living room where you and your guests can relax and recharge. The space features a comfortable leather sofa along with a flat-screen smart TV with Netflix and streaming capabilities. Adjacent to the living room is a fully equipped kitchen that includes all your basic appliances and a breakfast bar with seating for 2. The bedroom lies off the main living area and is tastefully decorated in cool tones and beach-themed wall art. Need a breath of fresh air? 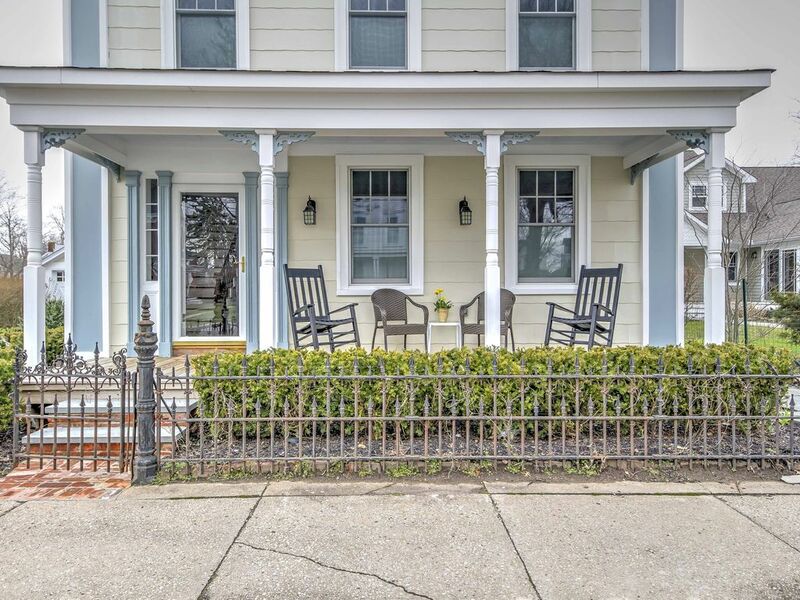 Enjoy access to a private porch on the side of the house that includes 2 wicker chairs and a small glass table. Enjoy the convenience of being only a short distance from downtown along with the peace and quiet away from the hustle and bustle. Located only 2 blocks from Main Street and 3 blocks from Front Street, head downtown for a day of fine dining and shopping. When you’re through exploring the village, hop a ferry to Shelter Island, a unique island community with country charm. For a day on the water, Sterling Creek is only a short distance down the street. Head down to the dock and watch the boating activity in Greenport Harbor or go for a swim in the cool water. - Amenities include a fully equipped kitchen, air conditioning, free WiFi, flat-screen smart TV, private side porch, patio furniture and more! We had a great time in Greenport at the Shellabration. Perfect location!! We stayed for the maritime festival. Apartment was perfect. Clean, comfortable and great location. Will definitely be back! Great property. We enjoyed our stay as the apartment had everything we needed, was very clean and comfortable. We enjoyed how much was in walking distance in terms of parks, restaurants, coffee spots, etc. would recommend! Clean, efficient, close to everything! Our stay was so lovely. We really enjoyed the convenience and comfort of the studio. We loved the fact that we could park the car once and walk to literally everything from Claudio's to Flavors. We wouldn't hesitate to stay here again.